Another week has flown by. Every other week a blogger is chosen as the spotlight dancer by the hosts of Mondays Music Moves Me. The spotlight dancer gets to choose a theme for us to use. Today our spotlight dancer is Joyce from Catch My Words. Her daughter is celebrating her 25th birthday today. I’d like to wish her a Very Happy Birthday. And apologies to Joyce for not following suit with the theme today. Instead, I wanted to share with you a new to me band. Every once in a while I like to check out the recommended videos from YouTube. Recently, there was a video that came up on the recommended list that I felt compelled to watch. I found myself really enjoying the music. Today, I’m going to introduce that band to you as well. The Rival Sons members are from the Long Beach music scene. Prior to the formation of Rival Sons, Jay Buchanan recorded as a solo artist, as well as with his band Buchanan, which had previously released ‘'All Understood’' in 2004 and True Love EP in 2006. Scott Holiday’s first success was in Human Lab who had recorded an album for Atlantic Records that was never released, then Black Summer Crush, (2005) where he was joined by Thomas Flowers (Oleander) and J. Harley Gilmore, (Ashes II Ashes, Weylon Krieger, Blu Cantrell) who later left the band in early 2006. Gilmore was replaced by Michael Miley, a successful studio musician. Miley was also previously in Veruca Salt (2005) and the Carson Daly TV band, where he met Robin Everhart at Isaac Hayes' house when they both played a Hurricane Katrina benefit show. Scott Holiday was searching for a new singer after the break up of Black Summer Crush and came upon Jay Buchanan on MySpace. Michael Miley had previously briefly played with Jay Buchanan in Buchanan. 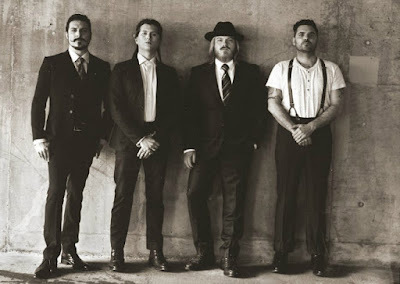 Rival Sons was the first rock band Jay Buchanan had sung with and he was initially skeptical as a blues singer songwriter and looked at the band as a side project. He was surprised by the reaction and the success the band received with their debut self-released album Before the Fire (2009). The band saw a bit of success, supporting other bands such as AC/DC, Alice Cooper, and Kid Rock and toured with bands such as Judas Priest, Queensrÿche and Evanescence. In 2013, bass player Robin Everhart left the band and was replaced with Dave Beste. Now that I’ve introduced the band to you, let me share with you a bit of their music. Thank you all for your input on the questions I had last week. I'm still mulling over some of it, but have decided to go back to twice a month battle of the bands (for now, at least). So tell your friends and tell your family to keep an eye out for the upcoming battle February 1st. Rival Sons is new-to-me. I enjoyed listening to the sample of mewsic you put together. "Keep On Swinging" and "Until the Sun Comes" really rocked me this morning. Thanks for the introduction. I may have to share them in a future post! They are a relatively new to me as well. I like that their sound is varied. Not the same sound for each song. Thanks for Erica's birthday wishes. This group is new to me. I was surprised to see that they have been around as long as they have. They are new to me as well. They sound pretty good, I will have to give them more of a listen. That was exactly how I thought of them when I first heard them, too. Found myself getting lost in the sound so figured I better write something up about them. The gentleman has some great vocal power & range. The slide is pretty awesome too! Love the tune too! Thanks for the introduction. I was also impressed with his dance moves. LOL They seem like a fun group. I think I like those songs the most as well. Their skills really impressed me. Thanks for the introduction to this new-to-me band. 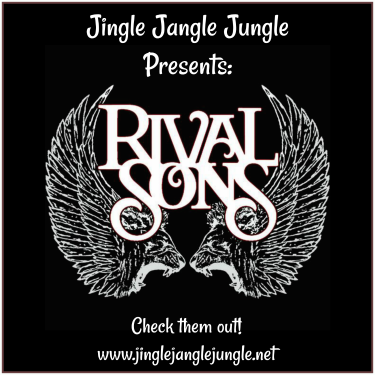 Rival Sons: I like that name! They have some good music, a good sound. I really dig the opening riff of 'Pressure and Time". "Keep on Swinging" reminded me a bit of Deep Purple. I also really liked "Open My Eyes" - the lyrics grabbed me. I could listen to "Until the Sun Comes Up" over and over...and watch that very cool video! Loved the lizard. Lol. Reminded me of claymation, kinda like Gumby & Pokey for some reason. ??? I really liked their cover of CCR's "Long as I Can See the Light" -- that's such a good song and they do a good job of it, adding their touch to it. I've been finding a few new to me groups via YouTube. I've got a few more waiting in the wings to share as well. But first... I need to write my post for the next battle. This month flew by FAST!!! Oh, new music for me! Thank you. The name Veruca Salt rings a bell. I wish these talented men all the best. Be well! I don't think I've done an actual post on Veruca Salt, but I believe I may have used them in a battle of the bands post before. The name was familiar to me as well. Enjoy the new music! Glad to see you're going back to the original 2-a-month BOTB schedule. So am I. One-a-month was a nice break, and just what I needed for awhile. But now I feel inspired again, and just one Battle per month made for a very long dry spell, where my blog just sat there doin' nuttin'. It's about time my blog earned its keep again. 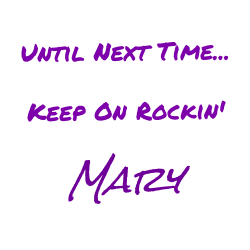 See ya tomorrow, Mary! I'll be Bach. I'm really excited about returning to the world of twice a month battles. You are absolutely correct - that reduction in schedule was a nice break. I think this move has left me feeling inspired as well. Let's hope the inspiration lasts! If you're going to be Bach, I'll be Beethoven.